We can set this up practically anywhere! All we need is a flat surface. 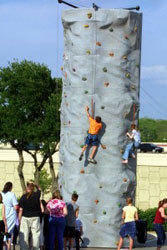 3 people race to the top, first person to reach the top & ring the buzzer WINS!!! Great for team building exercises, carnivals, field days, birthday parties or any group or family get together! Players must be between 30lbs and 250lbs to climb. 2 attendants provided. If there is a travel fee for delivery to your city, you will also need to include an additonal travel fee for the attendants. This price is for 3 hours, additional hours are at $150/hour.